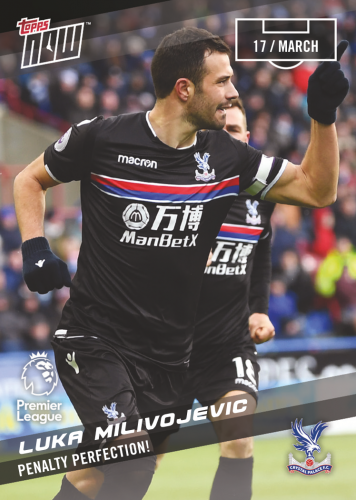 I've received my Puncheon Team Leader card already, and I have to say these are very disappointing cards - more what you'd expect from Stadium Club. They are as thin as Match Attax, and nothing special about them at all really. Can't believe there are so few cards to collect too. I think back to previous years Premier Gold, and I've got a quad auto book card, dual memorabilia, autos, quad relic, die cut autos, framed card and so on. There were some really unusual and special cards. Now not one single relic card for Palace! If you want amazing quality cards, have a look at Immaculate - these are top quality autos, patches and even boot memorabilia, and they are really thick! Only thing is its only Benteke and Hennessey to go for! Last edited by Dorking .Eagle; 09-02-2018 at 04:57 PM. Confused here....is this the same set of cards that normally get issued in the USA first ?, and we get the Topps stadium club premier league cards issued here ? They are usually issued in USA, but all the dealers in the Far East get them first, and it usually costs a fortune in postage. Last edited by Dorking .Eagle; 11-02-2018 at 12:04 AM. Let the World Cup collections begin! Adrenalyn Russia 2018 cards out now. Benteke to sink the countries hopes and dreams. Will be a quick hoover up to be honest, then bring on the Platinum collection! 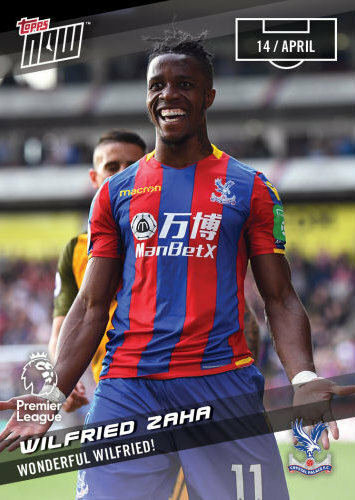 There's got to be a Topps Now card to commemorate our biggest ever PL win today! Will be watching out for it on Monday. Just seen the checklist for the new Panini Prism World Cup cards - not a single Palace player (not even Chungy!). Even the Adrenalyn World Cup cards have Luka! Did manage to get hold of a Luka sticker from the Tschutti Heftli 2018 World Cup collection, which is a bit of an 'alternative' sticker collection as different artists do each of the 32 teams! Last edited by Dorking .Eagle; 30-04-2018 at 01:40 PM. Just purchased. Does anyone have any old topps now cards they are willing to sell ? Did you get this from eBay, or is there a site offering swaps for this specific collection? Cheers. Panini have issued a 92 sticker 'update' set for their 2018 World Cup sticker colection, to round up previously omitted squad players. The version issued in Switzerland has gold borders.